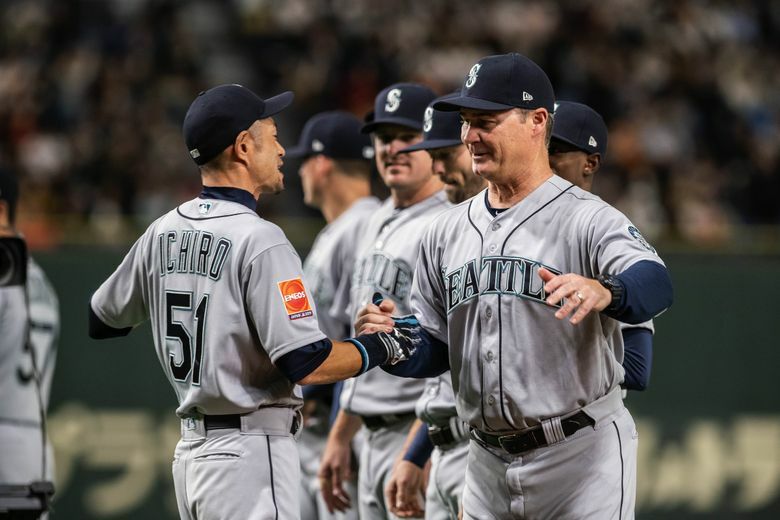 TOKYO — The Mariners announced their opening day roster on Wednesday morning in Tokyo in preparation for their first game of the 2019 season later that evening against the Oakland A’s. Because they are opening the season in Japan and about a week earlier than the rest of baseball, the Mariners and A’s are allowed to have a 28-man roster for the two games. The team must declare 25 eligible for that night’s game. The Mariners had to make a series of roster moves to get to those 25 eligible players. The most notable move was selecting Ichiro’s minor-league contract and placing him on the 40-man and active roster. He is expected to start in right field and bat ninth vs. the A’s in the first game. Multiple sources have said that Ichiro will be removed from the 40-man roster some time after this trip and before the home opener. He went 2 for 25 during Cactus League play and 0 for 6 in the two exhibition games. The Mariners re-assigned catcher Jose Lobaton and left-handed pitcher Tommy Milone to minor-league camp. Both players signed minor-league contracts with invitations to big-league camp. With the 40-man roster currently full with the addition, the Mariners decided to keep David Freitas as the back-up catcher instead of Lobaton. But with 40-man roster spots expected to open up next week after the Japan trip, the Mariners could select Lobaton’s contract and option Freitas to Class AAA Tacoma. Seattle declared right-handed pitchers Felix Hernandez and Mike Leake and outfielder Mallex Smith as the three inactive players on the 28-man roster. Hernandez and Leake started the exhibition games vs. the Yomiuri Giants earlier on the road trip, while Smith is still in Arizona rehabbing an elbow strain. This move means that the Mariners expect Smith will be ready to play when the team re-starts the regular season March 28 with the home opener vs. the Boston Red Sox at T-Mobile Park. If he wasn’t going to be ready, they would have placed him on the injured list. The Mariners did place five players on the 10-day injured list (formerly disabled list), all retroactive to March 17. The only surprise to this list is Armstrong, who suffered the oblique strain just before the team traveled to Japan. The injuries to these right-handed relievers only adds more uncertainty to the Mariners bullpen as they enter the season. They have targeted Hunter Strickland as the closer and lefty Zac Rosscup as the situational lefty late in games, but the remainder of the roles are a guess. Right-hander Dan Altavilla has setup man stuff, but has yet to find consistency, while right-hander Cory Gearrin does have 270 career big league appearances.